The press releases and some comments that came from Brussels yesterday really astonished me. “Turkey must protect the rule of law as it cracks down after the failed coup” declared the European Union’s foreign policy chief Ms. Federica Mogherini, on Monday morning (July, 18th). The EU Foreign Affairs Ministers said it was monitoring the situation as the Turkish government had prepared a list of people to arrest beforehand. “We are the ones saying today that the rule of law has to be protected in the country, there is no excuse for any steps that take the country away from that,” Ms. Mogherini also said as the Foreign Affairs Council met in Brussels. 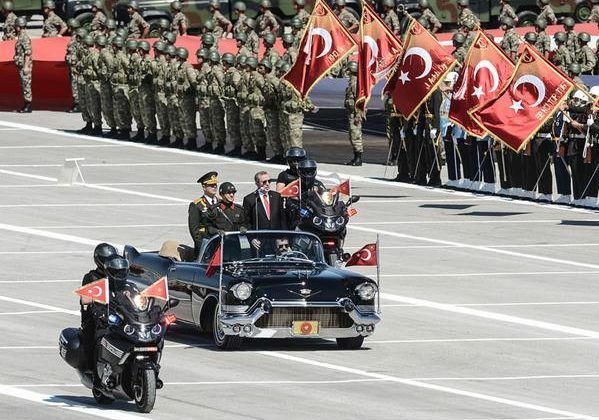 Judges and military commanders are among those 6,000 people who were arrested over the weekend as President Recep Tayyip Erdogan vows to stamp out the “virus” of the coup plotters. “I mean, (that) the lists are already available after the event indicates that this was prepared and at a certain moment should be used,” EU Neighbourhood and Enlargement Negotiations Commissioner Johannes Hahn told reporters. If it was ‘obvious’, as EU Foreign Affairs Ministers were saying, to respect any “rule of law” and the democratic “check and balances”, I don’t understand why they insist on repeating so much. If it was not “obvious” then they should explain to all EU citizens why they were working with Turkey to find and conclude a ‘migrant plan’. Were they working with a ‘regime’ or a ‘democratic country’? Secondly, I think that those concerns (the so called ‘pre-prepared lists’) are “insults” to Turkish authorities. The EU’s Foreign Affairs Council accused Turkey’s Government of having already prepared this “suspected plotter list”. Well, in the case that Turkey’s Government had these “suspected lists” that means their counterterrorism and intelligence systems were working very well and in the right direction. A completely contrasting performance in respect to the one of many European countries’ secret services. As the recent tragic events showed us, the anti-terrorist and secret services in Belgium and France did not exactly worked well in order to prevent and arrest terrorists. If the Turkish Government did not have these ‘lists’, we should congratulate them because they arrested so many suspected plotters. Congratulate and not criticise Turkey ant-terror law, because it is very well implemented and useful. Surely, Turkey is a democracy, where the ‘rule of law’ and democracy is implemented and where these values and rules will be more and more implemented, considering the EU standards and the historical, social, juridical and cultural Turkish tradition. Unfortunately, European uncertain and ambiguous ‘silence’ during Friday night tentative ‘coup d’Etat’ showed that EU Countries are closer to the Gulen’s interpretation of Friday’s events (as many mass media reported, the ‘coup d’Etat’ would have been prepared by Erdogan to increase his personal popularity and introduce the presidential reforms). This position is not only against the reality and against what happened. It also shows that this suspicion from the EU is the sign that we have lost the ‘false moral preening’ because our abuse of ‘double standards’, ‘bureaucratic machine’, ‘religious and moral values abandon’, ‘inconsistency on internal, social, economic and international affairs’. I think our countries should firstly monitor their systems, so that they can show others how well their ways of implementing the ‘rule of law’, democracy and human rights are put into practice. Only then we could invite and urge others to do the same. Turkey has a long and important history. Many times European countries fought against the Ottoman Empire. Many time Europeans defended themselves successfully or not. But every time, until now, Europeans have respected the Turkish people. Especially today, in this troubled time, we should respect this country, which is facing a dangerous internal and foreign terroristic attacks. Especially today, when they are striving to rebuild peaceful relations and friendships with Russia, Israel and others. Nowadays one may be criticising Turkey about the ‘death-penalty’ possible re-implementation. I am totally against the death-penalty, it’s against any human dignity and international and European convention. Nevertheless and without a doubt, the EU and NATO should use the same standards. They are criticising Turkey only because a parliamentary debate about ‘death penalty’ could take place in the coming months. Well, I support this critic, but please explain me why the EU and NATO are strongly connecting with the USA or why the Eu is trading with Japan or Pakistan or the U.A.E or Saudi Arabia or China? Why are we spending so much money and sending so many troops to defend Afghanistan, where the death penalty is implemented? We could strongly propose and defend our values but we should have a ‘minimum’ rational and coherent approach, if we want them to trust us. We worry about Turkey’s situation. But because we believe in our ‘rule of law’ and ‘democratic values’ we should support their institutions instead of discrediting them. The Global Coalition to counter ISIL met in Washington but…without the Kurds!